Michael Chanan's wide-ranging and illuminating study of international documentary film-making re-reads its complex history and present flourishing from the perspective of this fundamentally democratic aim. Michael Chanan's wide-ranging and illuminating study of international documentary film-making re-reads its complex history and present flourishing from the perspective of this fundamentally democratic aim. When the flm-maker Morgan Spurlock told an American festival audience 'we live in a world where independent documentary film has truly become the last bastion of free speech' he won a round of applause from the packed house. Michael Chanan's wide-ranging and illuminating study of international documentary film-making re-reads its complex history and present flourishing from the perspective of this fundamentally democratic aim. Chanan traces the history of the documentary from the first Lumiere films to Grierson and his contemporaries, through to Free Cinema, Cinema verite and Direct Cinema, up to the current resurgence of documentary with high profile films such as those of Michael Moore. Chanan's thematic approach takes in topics such as the documentary before documentary, how documentary film language works, the veracity of the image, the construction of the soundtrack, the migration of documentary to television, political documentary, censorship, first-person film-making, and the relation of the archives to history and memory. Drawing on examples of documentary cinema in Japan, Iran and Latin America as well as Europe and the USA, Chanan argues that documentary provides a crucial public space in which ideas are debated, opinion is formed and those in authority are held to account. When the flm-maker Morgan Spurlock told an American festival audience 'we live in a world where independent documentary film has truly become the last bastion of free speech' he won a round of applause from the packed house. Michael Chanan's wide-ranging and illuminating study of international documentary film-making re-reads its complex history and present flourishing from the perspective of this fundamentally democratic aim. Chanan traces the history of the documentary from the first Lumiere films to Grierson and his contemporaries, through to Free Cinema, Cinema verite and Direct Cinema, up to the current resurgence of documentary with high profile films such as those of Michael Moore. 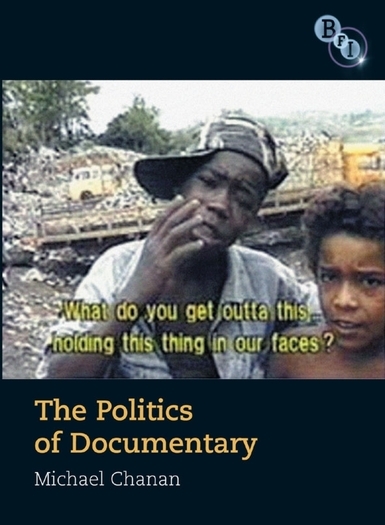 Chanan's thematic approach takes in topics such as the documentary before documentary, how documentary film language works, the veracity of the image, the construction of the soundtrack, the migration of documentary to television, political documentary, censorship, first-person film-making, and the relation of the archives to history and memory. Drawing on examples of documentary cinema in Japan, Iran and Latin America as well as Europe and the USA, Chanan argues that documentary provides a crucial public space in which ideas are debated, opinion is formed and those in authority are held to account.